Execution System (MES) to streamline FAA Certification. The Cirrus Vision Jet is the world's first single engine personal jet. 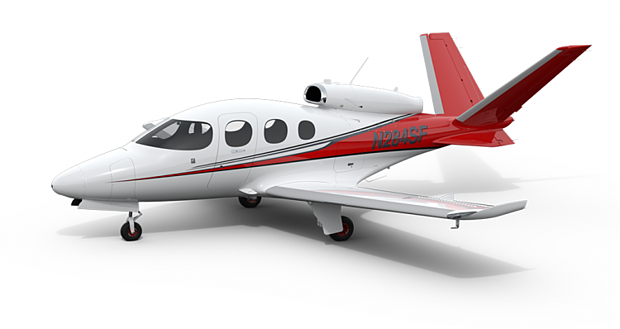 In order to meet strict conformity requirements set by the Federal Aviation Administration (FAA) for manufacturing design and airworthiness, Cirrus had to follow a six step process. Scanning and transmitting documents when reconciled to the agency for review. As you can imagine, this process has traditionally been incredibly labor intensive and time consuming. Cirrus Aircraft worked closely with the Federal Aviation Administration (FAA) to achieve certification for the Vision Jet, using Solumina MES in place of part piece level conformity. Going digital was a big part of the certification process transformation for Cirrus. By demonstrating compliance to the agency's strict regulations through its updated processes, Cirrus was issued the approval to use Solumina for conformity management of certification test articles on the Vision SF50 Jet program. "Solumina uses built-in best practices that allow us to streamline our manufacturing process, creating more efficient and compliant operations, both internally and at our supplier sites." Assembly Drawings: Digital design and work documents are generated directly from the MES. Automated NCRs: The MES delivers changes and generates Non-Compliance Reports. Top Collector: Conformity inspection and test plan are approved via Solumina MES. Historically, reconciliation was an incredibly labor-intensive process. Before Solumina, each packet of information required 40 minutes of reconciliation. This time investment has now been reduced to only 5 minutes per packet. Considering the number of packets involved in a project like the Vision SF50 Jet Program, an 88% reduction in reconciliation time means huge savings. Vastly improving the certification process and speeding product-to-market timelines means Cirrus needs less labor than it did before going digital. Now, even with less employees, the company can reach greater scalability of certification and reconciliation workflows than had been attainable in the past. to see how Solumina MES can work for you.